I think this sounds like fun! 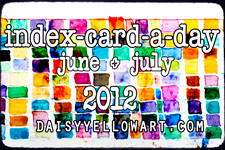 You create an index card every day for June and July. It can be a drawing, a quote, a list, anything! I'm really working on my handwriting. It's kind of messy and nondescript (unless I am teaching handwriting to my third graders and then it's pretty spot-on) so I might use my index cards to practice some hand lettering skills. There are some seriously talented artists in the group who produce amazing pieces! Anyone want to jump in with me? and the Flickr group is HERE! I have a finished quilt to show later. The photos are on my laptop and I'm at school! This page contains a single entry from the blog posted on June 1, 2012 8:04 AM. The previous post in this blog was Do Things Happen in Threes? . The next post in this blog is quilts and knitting and ICAD, oh my!.